Amiel and Lauren are a testament to cooking’s power to bring people together. They met at a cooking gig and haven’t looked back. Read about their journeys through restaurant kitchens and at Bon Appetit, and what they cook when they can’t think straight. Amiel: Food has always been a big part of my life. In my household, food was always very much the thing that was about abundance, love, and care. When I went away to school, I went to Oberlin College. I decided to go there partially because there was a really robust coop program. Instead of living in a dorm and eating at a cafeteria, I could live in a giant house with a bunch of other people and work together to cook meals for a hundred people, which was pretty wild, being 17 years old. I think that that was when I really fell in love with cooking on that scale. Thinking of food in the context of community became central to the way that I moved through the world. After that point, from 17 to 23, the only jobs I had were cooking jobs. When there was a job opening at Bon Appetit, it felt like a really cool opportunity to come up in an organization and learn the ropes of how magazines are made and how recipes get developed. My niche at the magazine has always been home cooking-focused. Two years ago, we launched a new vertical called Basically, which is organized around the generation of young people who are obsessed with food, but don't know their way around the kitchen. We explain ingredients and techniques and try to help people out while also being fun to read. Lauren: My mother is an amazing cook. Growing up, I always loved watching her, but it was her personal thing. It was her self-care even though it was an act of giving and took a lot of physical labor. I went to college and volunteered on an urban farm, worked with friends who had small cooking businesses. After school I became a social worker. I worked with adults with developmental disabilities, and we started a cooking curriculum to empower people who lived independently to feed themselves. About five years in, all I could think about were the cooking programs I was working on. I'd worked in restaurants since I was 14, but never worked in a kitchen. So, I started working at Tartine; trailed there one day, and then left my job. I feel really lucky because I haven't worked in one of those really icky kitchens where a lot of people can get stuck. If you get the opportunity to work in the right kind of kitchen, it can be this big, mind-expanding, experience. I moved to New York after a few years of working in restaurants in the Bay Area and worked with Gerardo [Gonzalez] at a restaurant called El Rey. After it closed, I staged around New York a little bit, but didn't feel like those kitchens were what I was looking for. At the same time, I got an email from a food stylist and I worked for her until October, pretty full time. There are these pockets of food freelancers and we all connect each other to jobs, work on cookbooks, food styling projects, and recipe development. I don't really know what to say when people are like, “What do you do?” I'm like, “food things.” I try to make food things happen for other people. If anyone comes up with like a more concise way to describe it, I'm into that. A: The thing that excites both of us about food and cooking is, as corny as it sounds, it connects you to other people. There's something really intimate and special about cooking and sharing food with people and it ends up connecting you with people who are different from you. It's also what brought us together. We met at a Bar Tartine cookbook launch party in 2014 that Bon Appetit was hosting. It wasn't really our first date, but in my mind I was standing in a windowless room, prepping potatoes and picking herbs, and that was an opportunity to get to know each other. Cooking feels very much woven into the fabric of our relationship. L: I feel really connected to anyone who does physical labor. For me, it's what I enjoy most and historically has been looked down upon and not valued monetarily. I think the opportunity to connect with people who enjoy physical labor was something that really drew me to the profession of cooking. A: You only have so many meals you get to eat in your life, so they better be good. Even when we're cooking a simple meal, just for the two of us, it feels like an opportunity to do something special to show care for each other or for the ingredients. It's a privilege to be in control of what you eat. It feels like something not to be taken for granted. Our go-to at-home meal is like, “All right, if you have a pot of rice, you have dinner.” We've tried to keep a pantry and refrigerator stocked with things that we know we're always going to want to eat. We're always going to want to eat jammy, six-and-a-half-minute eggs. We're always going to want to eat kimchi. 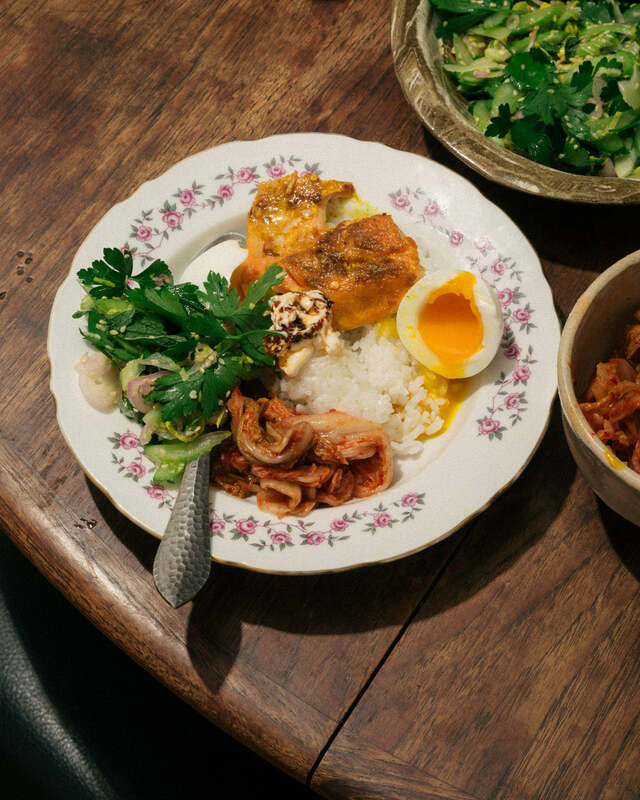 If you have rice, and kimchi, and a couple of eggs, that can be dinner, and everything else after that is a fun add on. L: That meal feels like a super staple. It's what we make on Sunday mornings for ourselves, if I'm working from home or having a friend over. I would say the other type of home cooking we do isn't performative, but we definitely get excited about meals that we read about in an old book or we saw in an old Jacques Pepin episode. They're not things that are typically technically difficult, but something that we've never done before. We'll tell each other about them, and then have a dinner party where we get to cook through the idea. Because with two people, you can't make that much unless you have people over. A: Working at Bon Appetit with so many people who are so excited about food, that's my happy place. Talking with somebody who is spending an entire week just thinking about chocolate chip cookies and what makes a good chocolate chip cookie. Getting to think about food in that exhaustively granular way is really stimulating for me. I draw a lot of inspiration from my colleagues and the inquisitive, curious energy that I get to be immersed in five days a week. L: I think that we both are really blessed to have cooks in our lives who we admire. Cortney Burns from Bar Tartine is, I would say, the reason that Amiel and I met and she is so deeply curious and loves to explore and is always striving to be a better boss, a better cook. She is endlessly inspirational. I admire Caroline Fidanza who used to own Saltie and she's now the Creative Director of the Marlow Group. I once got a little bit drunk at a pop-up and told her she was my idol. That's kind of embarrassing but it's true. I see her now and I’m so shy. I work a lot for, Camille Becerra, who I met before I moved to New York. I've watched her climb the culinary ladder and decide along the way what that means to her. I’ve watched her, as a woman, continually come up against the challenges of a majority-male dominated industry, and just keep figuring out what her next step is. A lot of the women I have worked with make me really excited to keep going, and the idea that we can lift each other up and that we don't have to be competitive really drives me and I hope continues to happen in the future. "Our go-to at-home meal is like, 'All right, if you have a pot of rice, you have dinner.' "
Add 1 ¼ cup cold water and a pinch of salt. Set on burner over high heat. Once the rice starts to boil, lower the heat to its lowest setting. Put a lid on the saucepan and set a timer for 18 minutes. When the timer goes off, remove the saucepan from the heat and remove the lid. Do not stir the rice. Lay a clean kitchen towel or a couple layers of paper towels on top of the saucepan and cover again with the lid. Let the rice rest for 10 minutes, fluff, and serve.